When looking for a simple refried bean recipe I came across Refried Beans Without the Refry Recipe – Allrecipes.com. This was so easy and my family fell in love. My daughter is constantly asking when I will make a pot of beans. Not only is the an inexpensive side dish but is makes a large quantity that can be split and frozen for later uses. You are controlling what goes into the beans including the amount of salt. I make these beans as a side dish usually with mexican food. We eat them up through the week by making bean and cheese burritos for lunch or into a tasty late night snack dip. Give these beans a try you can’t go wrong. I gave the recipe my own tweaks after making them multiple times now. Place all the ingredients in a slow cooker. Cook on low for 8 hours. Placing a colander over a bowl strain the mixture of all liquids (but reserving the liquids). Return the beans to the slow cooker. Using an immersion blender pulse until desired consistency adding about 1/4 cup of liquid at a time as needed. You can also mash beans with a potato masher for a coarser bean. Taste for additional salt if needed. Posted in Crockpot, Recipes, Vegetables/Sides and tagged black beans, COOK, Crockpot, dried beans, Garlic, Jalapeño, mexican food, Onion, pinto beans, Recipe, Refried beans, salt, side dish, Slow cooker. Bookmark the permalink. I enjoy making and eating Spinach Chicken Flautas but was feeling creative the other night when I started to prepare them. This is how I came up with Southwest Chicken Flautas. I combined the other recipe with what was on hand in the fridge and these turned out even better. These flautas are not as dry so you can eat them without dip. The sweet corn plays nicely with the spice of the pepper and spices. Mr.Picky said these ones are way better and took many to work with him the next day. These have been cut in half to cool for the kids! Prepare a cookie sheet by lining with foil and lightly spraying with olive oil or cooking spray. In a small saute pan combine jalapeno, corn, minced garlic, baby spinach, and 1 tbs olive oil. Saute until corn starts to brown and the spinach wilts. Set aside. In a large bowl combine all of the remaining ingredients and the vegetables that have slightly cooled. Mix until evenly combined. Using the tortillas cut them in half. Spoon about 2-3 Tablespoons of filling on the straight side of the tortilla. Roll the tortilla tightly from the straight edge to the round edge. Place on the prepared cookie sheet seem side down. Lightly spray the tops of flautas with cooking spray or olive oil spray. Bake at 400 degrees for about 10 minutes, flip and cook 5 minutes more until golden brown. Allow to cool for about 5 minutes before serving. We served our flautus with refried beans and guacamole. They reheated great in the oven at 350 degrees for about 10 minutes for a quick lunch the next day. Posted in Appetizers, One Dish Meals, Recipes and tagged baked, Cheese, Chili powder, COOK, corn, flautas, Garlic, Home, Jalapeño, Recipe, salsa, serrano chile, shredded chicken, Sour cream, Spinach. Bookmark the permalink. Fruit with a bite is the perfect way to describe Aunt Debbie’s Cantaloupe Salsa. Sometimes I skip the chips and eat it straight out of the bowl with a fork. My Aunt Debbie married into the family and we warmed up quickly when she brought her famous salsa to a family get together. Not only is this salsa super healthy, it is also flavorful and versatile. Aunt Debbie said it is great on top of fish or chicken, she tops the chicken and fish with salsa covers and bakes. I am going to have to make some to try this out. Combine all ingredients in a large bowl, best if the flavors are able to develop for an hour or two in the fridge. This is a really forgiving recipe. Aunt Debbie has stretched the recipe for another meal by adding chopped apples, mango, peaches, or even tomatoes and sweet corn. Posted in Appetizers, Recipes, Salads/Dressings and tagged appetizer, baked fish, cantaloupe, cantaloupe salsa, Chicken, chips, Cilantro, fresh ginger, Garlic, green onions, Jalapeño, lime, Salad, salsa, sweet pepper. Bookmark the permalink. My Mr.Picky is one spicy man. The hotter the better, years ago he tried candied jalapeños on a burger and has craved them since. He found a recipe from Tasty Kitchen-cowboy candy and hoped for the best. They turned out better than he hoped. Tasty kitchen had great directions for canning if mine are too general. I tried one with just a few seeds and it was wonderful. Once he opened the jar, they were gone within a week. He put them on everything from sandwiches to inside burritos. These are spicy but with a sweet flavor. A few of them would do me fine, but Mr.Picky eats them straight out of the jar. We adjusted the recipe to make about 2 pint jars, and this is the quantities we used. Wash and slice jalapeños with the seeds into rings. Wear gloves during this part to keep from the jalapeño oil getting on your hands. In a medium pot bring to a boil sugar, vinegar, and spices. Boil for 5 minutes. Add in sliced jalapeños, and boil exactly 4 minutes stirring occasionally. With a slotted spoon or spider scoop out jalapeño and place in sterilized jars. Bring the sugar mixture back up to a boil and continue to boil another 6 minutes. Fill each jar with equal parts of liquid, leaving at least 1/2″ head room in each jar. Wipe jars down and place a clean new lid and seal with a screw band. Process pints for 10 minutes and remove to cool at least overnight. Store jars in a cool place for at least two weeks before opening. Posted in Canning, Recipes and tagged candied jalapeno, canning, Cheese, COOK, cream cheese, Home, Jalapeño, Seed, Shopping, spice, Wine tasting descriptors. Bookmark the permalink. Spicy, smoky and a bit of sweet someone stop me from taking another. Watch out you will just continue to eat and eat these. I could and have made a pan just to eat as a meal. And don’t think you will be bringing home any leftovers if you bring these anywhere. I read through many pepper recipes before I concocted this recipe to my taste. I can’t tell you how many people have asked for the recipe (which I winged it) so I had to write-up some sort of measuring concept. Allow flexibility to your taste. The spice all depends on the temperature of the peppers, which is always a surprise. But for the most part when you roast these, most of the heat cooks out and makes them tolerable. After cleaning my jalapeno I set them on my baking sheet, you will have 24 peppers to stuff. Mix cream cheese, mayo, ranch, bacon, cheddar cheese until combined. Fill peppers to the edge of pepper with filling, then dot BBQ sauce on top. Bake at 375 degrees for about 30 min, you can increase heat to 400 for the last 5 min. if you prefer. The peppers will be slightly blistered and the filling bubbling and starting to brown. *You can leave off the BBQ, but I love the smokiness and sweet flavor it adds to the heat. I used to only put BBQ on half the pan when taking somewhere because I was worried that some might not like it. Until everyone just kept eating the sauced ones first. So now I just sauce them all, and they all disappear before you know it. *Recently I had two events a few days apart so I cleaned and prepped all my peppers(this is what takes the most time). I used half the first day, and just refrigerate the filling and peppers separate. Finished filling them up and cooking few days later and they were great! You can stuff them and put them in the fridge probably a whole night before, just be aware your fridge will smell strongly of spicy peppers. 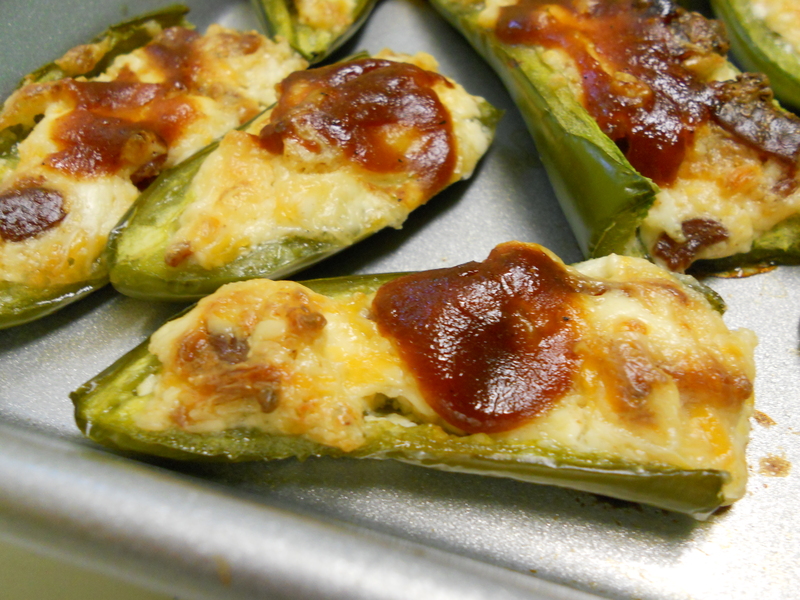 Posted in Appetizers, Recipes and tagged BBQ sauce, Cheddar cheese, cream cheese, Hot, Jalapeño, Pepper. Bookmark the permalink.